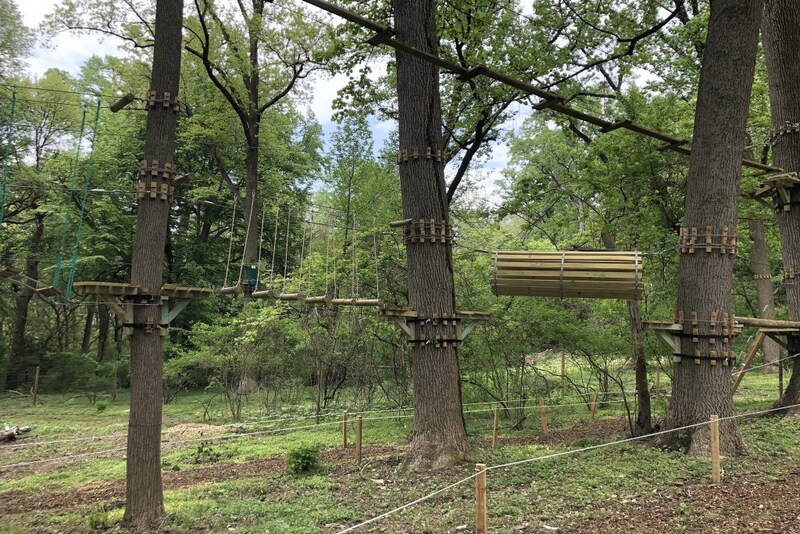 On May 12, the long-awaited Treetops Quest zip line and ropes course is opening in Fairmount Park. We had the chance to check it out ahead of time, and we’re happy to report back that it’s just as fun as it sounds. 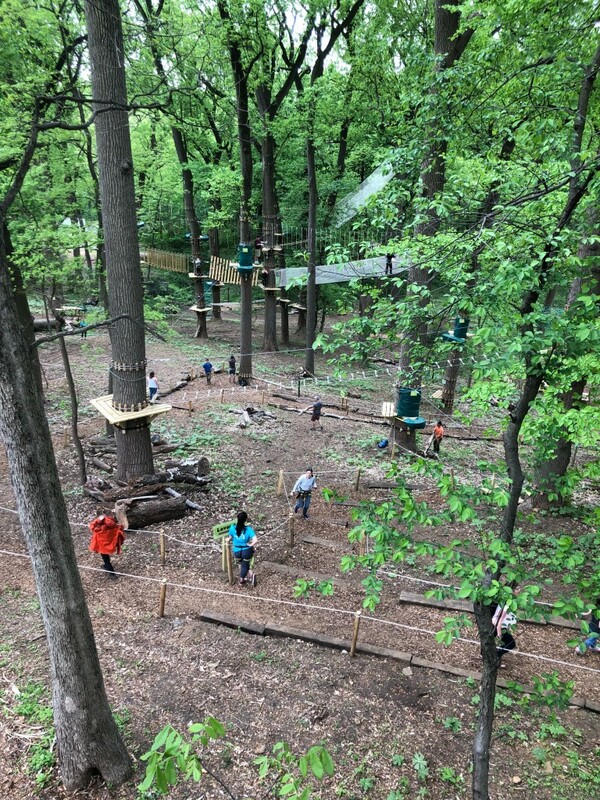 When you first roll up to Treetops Quest in Fairmount Park, you’ll notice a walled-off area with a ropes course. This, my friends, is not the ropes course you’ll be trying. This is the “Chick Peas” course, intended for four year olds. The practice course. Photograph by Caroline Cunningham. Nope, instead, you’ll get strapped into a harness by the pros and get a quick lecture on your hook (the thing that keeps you attached to a cable the entire time you’re on a course) and your pulley (the thing you use to glide across the cables as a zip line). Next, you’ll get to practice using your hook and pulley on the mini course that’s just a couple feet off the ground. Once you’re well acquainted with your equipment, you head down the hill into the woods. That’s where the real fun begins. 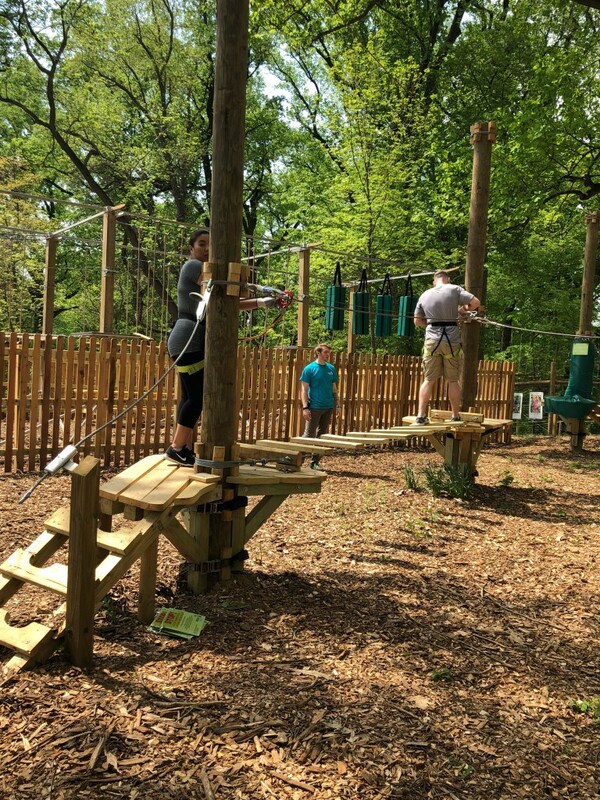 There are five courses spread out over four acres at Treetops Quest, all of which mix different obstacles and zip lines (there are 18 total zip lines on the property). The courses are numbered both by difficulty and by distance from the ground — course number one is the lowest and easiest, then there’s courses 2A, 2B, 3, and 4. Course number three is a ton of fun; it’s got the most zip lines. Course number four is the hardest — you basically need to be an American Ninja Warrior to complete it — so be prepared to break a sweat. One of the tricky obstacles. Photograph by Caroline Cunningham. Entrance to the park starts at $19 for ages four to six and goes up to $51 for adults (though it’s $2 cheaper if you book online). Tickets are scheduled out at different time slots throughout the day, and each ticket gets you two and a half hours of play time in the ropes courses. Once you’re trained on the harnesses, you can choose your own adventure in the park, starting with courses 1, 2A, or 2B, and then trying the harder ones — courses 3 and 4 — if you so choose. Alternatively, you can stick with the first course the entire two-plus hours — it’s totally up to you. The view before a zip line. Photograph by Caroline Cunningham. While you won’t have a guide leading you through, there are attendants on the ground who can talk you through an obstacle if you get stuck. Also, should you make a mistake and find yourself dangling from your harness, they’re prepared to come to your rescue. 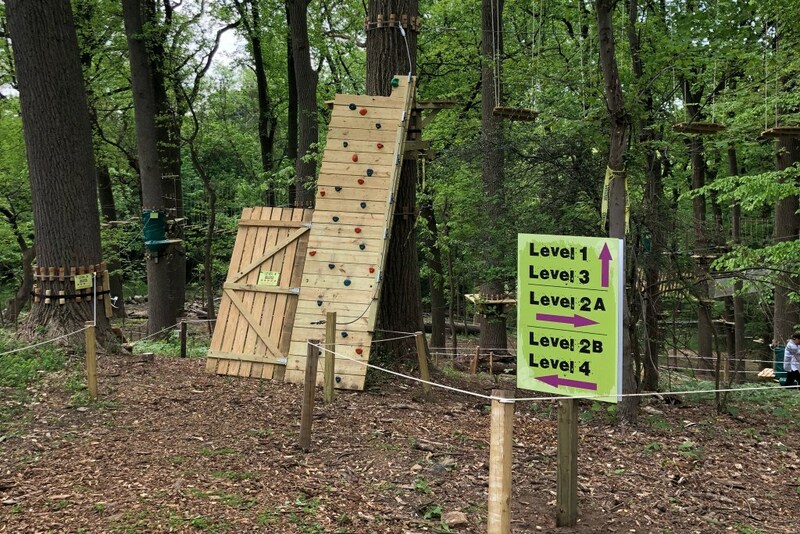 While there are parts of the course that are pretty freakin’ scary (think: walking a tightrope with nothing but air beneath your feet or dangling from the monkey bars high in the sky), you’ll be amazed at how quickly you can adjust to the height. And for all the adrenaline-inducing obstacles you tackle, you get to reward yourself with the zip lines stationed throughout — by far the most fun part of the experience. Ready to try it out for yourself? 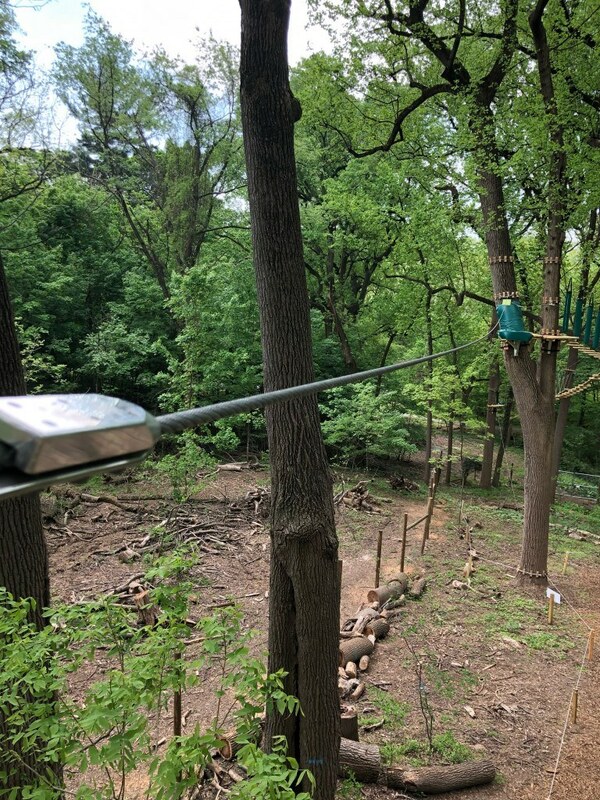 Treetops Quest opens on May 12 at 10 a.m. In honor of the opening, you can score 20 percent off your ticket with the code PHILLYOPEN if you book your tickets online. 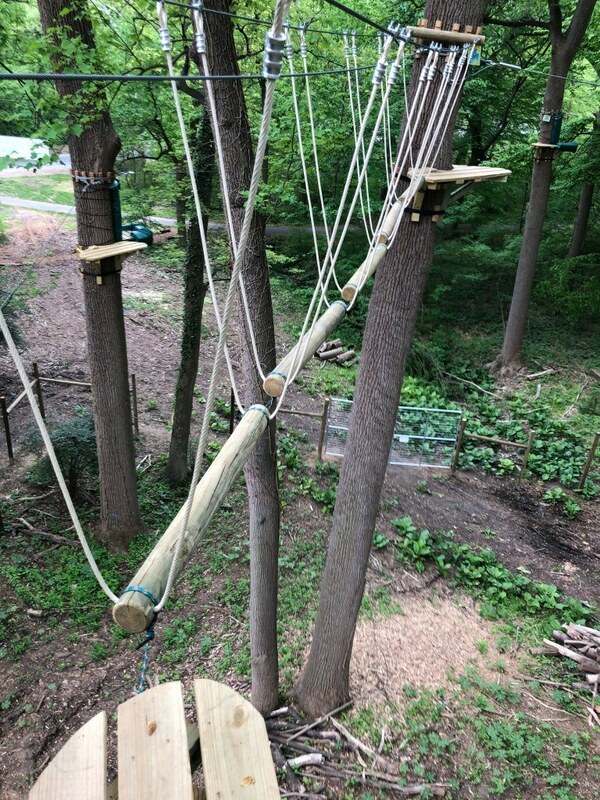 Treetops Quest is located in Fairmount Park at 51 Chamounix Drive. Happy flying!